Yesterday the streets of London were for cyclists only. 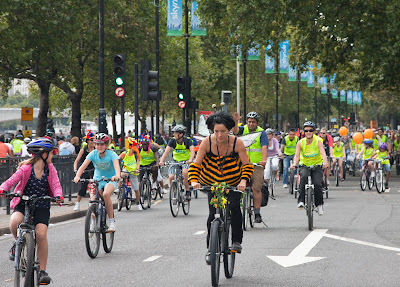 Over 65,000 took up took advantage of the Mayor of London's skyride. I had no idea there were that many bikes in the city. Singing and the ringing of bicycle bells are loads more fun than petrol fumes. Don't forget my competition that is running at present to win yourself a pair of tickets to Brussels. It closes at midnight tomorrow. So make sure you get your entry in. Love the bumble bee outfit. Were there any cars at all allowed on the road? What a great idea with SKYRIDE! And I enjoyed the link with the "you tube" film. Heehee! I love Ms Bumblebee! Sigh. I wish we could use more bikes more often, but it's kind of hard when it rains everyday for half the year. Looks like a lot of fun. Creative woman isn't she? I prefer to run and walk on the streets of London. I can only agree. What a wonderful day with a city reserved for cyclists. Now when will we start making progress on the remaining 364 days? We have some 30 or 40 thousand bikes in Paris now for short time lease (almost free of charge). Great success! Will our streets soon look like some Asian streets some years ago ... before the motorbikes and cars? Would have loved to have been there riding it too! Imagine a night-time ride, with bikes and riders festooned with bright lights and refective gear. It would be an amazing and dazzling sight!